The Mitchells’ backyard was packed, full of recent and not-so-recent grads in various stages of party decay. My first thought when I finished I’ll meet you there was: Why am I not living in a freaking YA novel? Since I finished reading The Problem With Forever (you can find my review right here) I was in a bad book hangover. I couldn’t think about anything else, any other book and just wanted to live with this beautiful feeling of having read such an AMAZING book. When I realized that this can’t be my reading situation forever, I asked my lovely Re from The Bibliotheque (find her amazing, stunning and inspirational blog right here and her just as pretty and inspiring Instagram here) for recommendations and she said I should read I’ll meet you there by Heather Demetrios. I know and love her taste and so, of course I picked it up! I don’t know why but lately every time when I pick up a book I have a very slow start with three days of not getting any further but after this time span I immediately get addicted of the book, the story and their characters and end reading the book within one maybe two days. The same happened here. It was a slow start and I struggled to get used to the places and situations the story took part in but then I wasn’t able to stop reading. This story is SO different. Josh who came back from Afghanistan with just one leg, obviously as a different person and Skylar who wants to escape from Creek View and her broken home like noone else. Skylar’s greatest passion was art. And I loved this thing about her A LOT! I am interested in art too and I love when things I love are involved in stories and are part of the characters! Sky did awesome collages and knew so so much about art and artists which made the book more real and also educative in a certain way. She showed many times how strong and caring and tough she is and I liked that she got even stronger during the story. Nothing ever goes to waste with collaging (…) It gave me hope: if you could make a beautiful piece of art from discarded newspapers and old matchbooks, then it meant that everything had potential. And maybe people were like collages – no matter how broken ore useless we felt, we were an essential part of the whole. We mattered. In my opinion Josh was so different to all of the other YA male characters I read about before. He was broken and haunted by the war and all the bad things which happened back in Afghanistan. The most obvious thing was that he has lost one of his legs and even though he tried to be strong and to behave as cool as the Josh before the Marine, he struggled and THIS made me want to hug him. Take all the nightmares, bad thoughts and his sadness away from him. He was so lovely and caring and sweet to Skylar and noticed that he needs her while not realizing how much she needed HIM. Heather Demetrios shows perfectly how he’d changed from the High School Josh to the Josh with just one leg but also how this Josh develops because of Skylar. I loved it. I loved him! Every few chapters, a short Josh chapter followed which was great because like this the reader gets an little insight of his head and thoughts and yeah…like I said before…I just wanted to hug him. 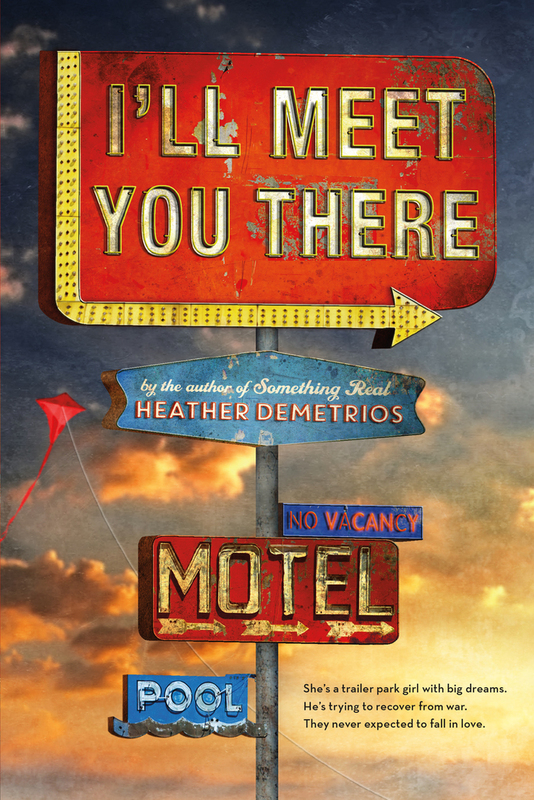 I’ll meet you there is a perfect YA book! YA has to be exactly LIKE I’ll meet you there. It’s a story about love, sadness, friendship, loss and about having the strength of letting things go and start new ones even if they look scary. Side note: Read the book to the VERY END. I got emotional! Just saying! Do you have any YA recommendations for me? I would love to know them because these are the books I need lately!